These books offer tips and tricks to keep the kids entertained and help you keep your sanity. Oh, the joys of traveling with the whole family. No parent wants to be the one whose child throws a temper tantrum on an airplane, or has the toddler running amok at a rest stop. As summer's recesses and long weekends come around, never fear: These books offer tips and tricks to keep the kids entertained and help you keep your sanity. Let's start with baby. Shelly Rivoli has three young children, and has traveled with them through the Far East, Africa, Europe, and across the States. 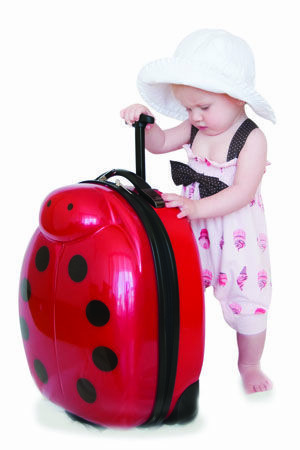 Her "Travels with Baby" offers comparisons of airlines, cruise lines, train travel, as well as lots of advice on how to travel safely and easily--and perhaps most importantly before you leave, how to match your child's temperament to particular trips. Leslie Forsberg and Michelle Duffy's guide "Traveling with Kids"starts by helping parents come up with ideas for trips, then goes step-by-step through the logistics: pre-trip planning, getting there (and back), what to pack, how to stay safe--oh, and don't forget to try to have fun while you're there.